109 Comments on "15-Ton Prehistoric Shark Captured Off Coast Of Pakistan"
Cause of death: suffocation, since sharks need to constantly move in water to breath and have no way to store oxygen. Are rising sea temperatures forcing these beasts to come up closer to the shores or was this animal simply hurt and suffering from a disorienting handicap, these questions are left unanswered – there isn’t anything saying that it was killed, it says captured, maybe it was found in theyre nets..
it said they did an autopsy on it, that means its dead. WHY DID THEY KILL THE BABY! I am unhappy to see comments from a bunch of animal rights morons. Please read the article before invoking the animal (rights) in you, you bumbling idiots. Pressure, change in pressure killed the baby. If you are so concerned about it, launch a war against Pakistan a la WMD war against Saddam:)-. WOW…. its only a baby… where is mummy? Probably waiting to attack the next cruise ship because we killed her baby. Well sharks are known to be loners, so honestly the mom didn’t even know the baby was gone. I agree. It should have lived. Why kill it? I agree- leave them alone. Study live specimens. You learn so much more. Our first reaction when finding a new specie is to kill… How sad. Its only 2-3 years old and we haven’t seen one in how long? At least we can now study it to expand our knowledge on deep sea creatures. did they kill it or was it found dead? More noble presumptions by the animal rights folks. All I read was “captured”. Didn’t see the condition at time of “capture”. Live, dying or dead. I THINK THESE SORT OF SPECIES AND ANIMAL SHOULD BE SAFEGUARDED NOT KILLED. 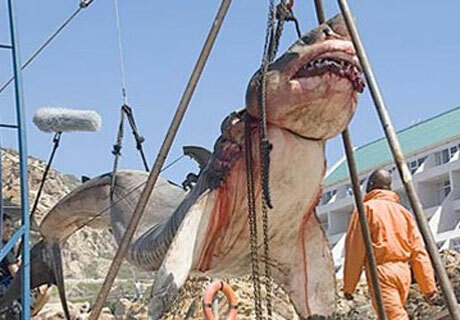 It says the “captured” the shark, there is not even one moment where they said that it was killed. Even a section of the article points out that the reason for the shark’s death is unknown! think about it…how would u reel in a 15 ton super shark? The article I read said it was found dead, well unconcious and by the time they got it reeled in it was dead. if it was 3 years old then there’s a good chance more exist. 2 to 3 years old ……its parents are still out there…….. They should never have killed this magnificent creature. We are slowly destroying animal life on our planet. How sad. Your going to need a bigger boat! They thought it was a great white, It was an accident. Hopefully they took enough blood samples to one day clone it. I agree, why kill it? Do we have to kill everything??? Did any of you actually read the article? It clearly states the animal was already unconscious when they found it. It clearly was already dying as the pressure change alone would be a fatal blow. They didn’t ‘kill’ the creature. yes, but now it is dead just think of all those giant squid that will grow big enough to drag thousands who travel on ocean liners to their deaths! does this not tell us something, we have found one now. this shark is only a baby 2 years old, should we not be thinking there numbers might be increasing! not as extinct as we thought maybe more money should be put in to researching our oceans depths, what else is lurking in the darkness. I agree, let them live, but it looks like they captured it because they thought it was a great white–the experts are who determined the shark was an undetermined species. May as well do research with him now that they got him. Totally agree. The only reasons creatures become extinct is because of ignorant humans who think they have the right to destroy any living thing for their amusement or exploration. Reading this has made me so angry. How would they like to be taken from their home and butchered! Leave it to fisherman to do what science has failed to once again. That’s why it is dead. It likely got the Benz from being brought up from depth too quickly. Guess which one these morons went with! Live and let live! Why not tag it and explore the sea with it? Why do we always have to kill things to study them? I agree. It helps the ocean life stay in tact. Why couldn’t it live? Obama has taken credit for its capture and for its death. Hold on guys, you with the whole “fishermen shouldn’t have killed it!” One thing, the article didn’t specify if they killed the shark or if it just died on its own for whatever reason. Two, the pressure changes from the greater depths coming up to shallower water would have most likely killed it. If the pressure changes didn’t killed it then it probably would have injured it internally. It’s about the same as when you fly or drive through mountains and your ears pop. Only if you can imagine, your internal organs are basically crushed by your swim bladder, we’ll because you’re a fish or shark. Sometime, your insides my get pushed out through your mouth by said swim bladder, just depends on the situation. Maybe I missed something. I didn’t read that it was killed. The article alluded to it being hurt. Maybe it was already dying or dead when they found it. Why do they have to kill it? Because they feared it!! It gave them a sense of “Victory!” Today’s world is so f…well, you know what I mean!!? Peace to ALL!! Spread Love, Peace, & Life! Smile, it makes people wonder what you’ve been up to…when in fact, smiling spreads Good feelings and maybe it will help all the non-sense killing in today’s world! They couldn’t do anything but kill it. They are uneducated 3rd worlders. A bunch of guys on a boat and here comes a giant shark…what are they going to do…kill it!! Maybe they thought it was going to tip over the boat! Very interested in how they landed the thing. It takes hours to wear down a thousand pounder…how did they manage this??? Very curious, and saddened this happened to the young shark! This is proof that if one exist, there is a breading population!! Why do we always have to kill that which we do not understand. This creature had a right to live. Yes they should have left it alone!!!!!!!!!!!!! !So sad mankind is destroying everything God has designed because of Science?? I agree it should have been left alive – what if it was the last one…. I would have had my freezer full and everyone I know would too. Definitely no food shortage in Pakistan. Sad that this creature was killed. What a shame! I also think should have been left alive.Also if it’s only few years old must mean there’s a mommy & Daddy right? Sooo if it is 3-4 years old, then isn’t that reassuring that there is at least a small population of other sharks like this that are breeding??? It is unfortunate that this specimen is deceased but I am excited by it’s age… there have to be more! The problem is, it wasn’t doing well when they found it. We can’t even keep great whites in captivity for very long, we know nothing about this shark, etc. If we don’t know its habitat and feeding needs, it’s better off dead. The marine biologist in the article said it was disoriented or may have suffered an injury, making it come up to the surface. As a biologist, sure, I don’t particularly love killing things and looking at them, but it’s what we do. This specimen can now be preserved and kept in a museum collection for years to come, so others can study this ONE specimen instead of going out and killing a bunch more. Trust me, the government isn’t going to run off and kill these guys. Lots of sharks are protected and considering this species is incredibly rare, the same will be done to this one. Are you idiots serious? He would have died being out of deep sea anyways. On a side note what did you want them to do? Dive down and see what they had caught? There is another one out there in the sea/oceans. This might of been the one that knocked/bite a hole thru that family’s boat. Couldn’t they have tagged it? l love shark… marinated then grilled next to asparagus & served with rice. mmmm. What I’ve read of this article, States local fishermen captured the shark – they assumed it to be a great white – People who could identify the species were not around while it was still alive. Yes, it’s sad, but they did not know what they were pulling out of the water at the time and I’m sure the assumption made however, was … it’s just another shark, be it a big one. And where exactly in the article did it state “fishermen killed it”? A bunch of bleeding heart lib morons on the comments page.. I being a shark lover is disgusted by how people treat a fish that’s survived longer than all of us it should of been tagged and released or left alone completely people wonder why sharks attack humans when humans kill hundreds of sharks every year sharks have more of a right to live on this earth than us. You mean to tell me that thing has a mommy and daddy out there somewhere? I’m never going in the ocean again! Matter of fact, I’m never even going on a boat! And we killed another old and magnificent creature. If you find a critter that is thought to be extinct or one that is very rare it should be left alive. Study it while it is alive and in an aquarium .! Seriously? These guys were simply fishing for food. How many of you idiots have NEVER eaten fish? How many of you know that fisherman supply food fo Billions of people? Sharks are mindless preditors that eat anything including people. PERHAPS YOU WOULD RATHER HAVE THE SHARK EAT YOU? If you’re used to high pressure, then you will literally be destroyed when you move to a low pressure environment. The fishermen didn’t kill the shark, the shark killed itself, it was a baby after all? You don’t know what you have on the line until you pull it out of the water. It clearly states that they did not know that it was not a Great White even after they pulled it out of the water. So by the time they figured out that it wasn’t a Great White – it was already dead. That’s fishing. Sometimes you get a fish, sometimes you get a boot, sometimes you get a shark that previously all experts said was extinct and therefore couldn’t be pulled out of the water.